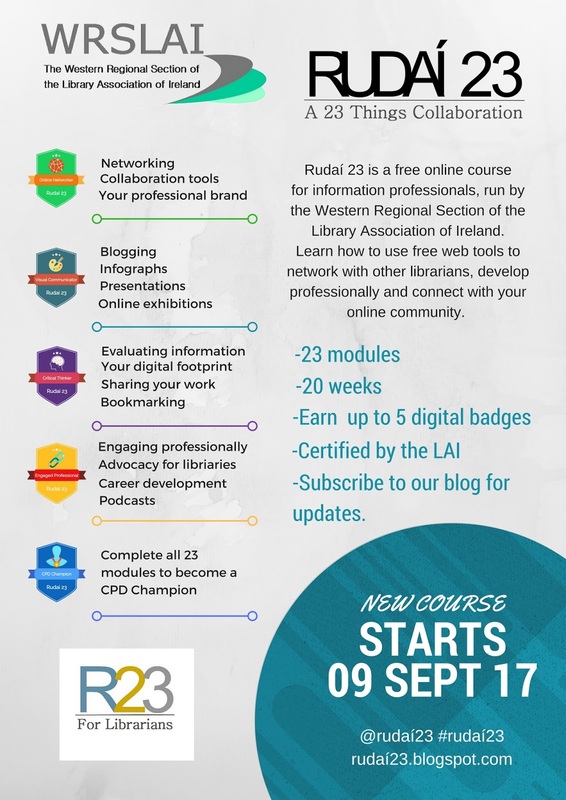 Rudaí 23 is an online, self-directed course based on the 23 Things program, delivered by a collaborative group of librarians and educators, in association with the Western Regional Section of the Library Association of Ireland, and The Library Association of Ireland. The course is accredited by the LAI. Visual Communicator, Online Networker, Critical Thinker, Engaged Professional and CPD Champion. The course will cover current issues and trends in the information profession as well as the use of web technology to promote your library and network with your peers. Participants must complete a series of simple tasks such as learning how to use different presentation software like PowToon, or maybe you would like to know more about collaboration tools such as Basecamp. We shall be experimenting with Augmented Reality through apps like Aurasma. Learning includes reflecting so we ask you to write an online blog post about your experiences which in turn lets you earn the relevant badges. This course will be of interest to information professionals who would like to learn more about using web tools for professional development and promoting your library, by the end of this course you will have a fully functioning professional blog, a wide network of professional online colleagues and you will be completely up-to-date on what's current in the world of libraries, online collaboration and social media. We are delighted to confirm that registration for Rudaí 23 will open on the 28th of August and the first module will begin on the 9th of September. For more information email westernlibraries@gmail.com and follow us on twitter @rudai23 @wrslai to receive updates and don’t forget the hashtags #rudai23 #23things.